A lot of people now are interested, go to Japan because of the cheap flights being offered by some local airlines here in the Philippines. I received a lot of inquiries on Getting A Japan Tourist Visa in the Philippines without Income Tax Return especially on how I wrote my letter of explanation. Now, here’s a screenshot of the draft I wrote last year. This letter I wrote was the second time I applied for a visa which the intention is to get a multiple entry visa. I wasn’t granted for the multiple entry, but I am still happy that they granted me a single-entry tourist visa. I think one reason why I wasn’t granted a multiple entry visa is because I don’t have any proof of employment as what I have mentioned in my letter, I quit my job and do volunteer work. What’s important is Embassy of Japan granted me a tourist visa to get in Japan the second time around on the same year. To get that Japan tourist visa, you have to show that in your bank certificate, you have enough money to travel in Japan. Although it is expensive, I was able to get around on a low budget. Aside from bank certificate, I also submitted the original copy of Stock Investment Certification. To make it more authentic, I wrote my letter of explanation by hand. Everyone has its own explanation of getting a visa. I am just sharing you here how I wrote mine and hope this will give you an idea. Why do you love to go to Japan? Please check out this article –> How to Request Stock Certificate from COL Financial Philippines for Visa Application? 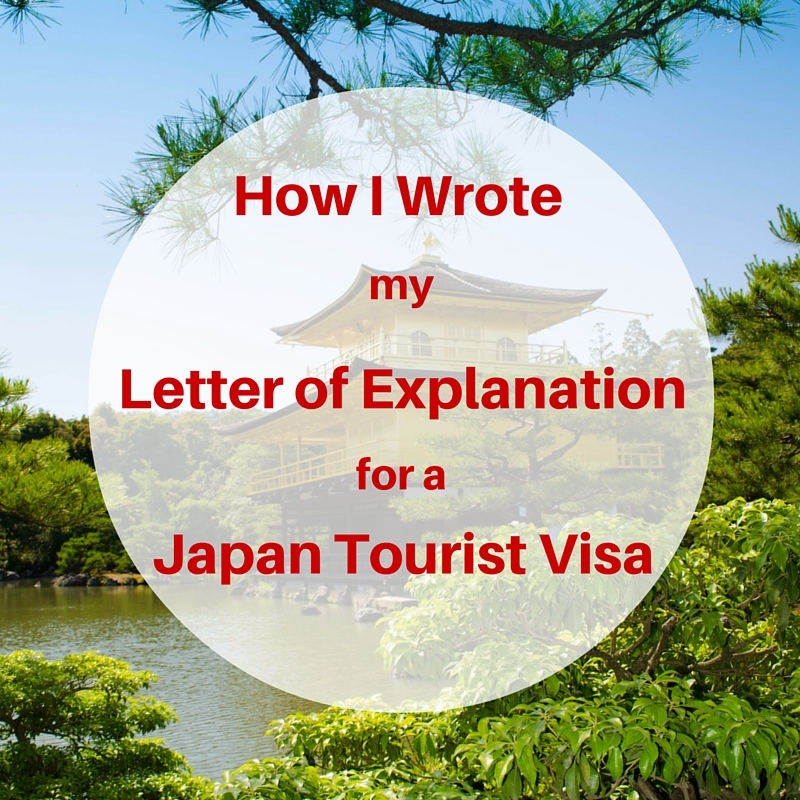 This entry was posted in Visa and tagged how to write a letter of explanation for japan tourist visa, Japan, Japan Letter of Explanation, Japan Tourist Visa, Letter of Explanation, letter of explanation Japan. Bookmark the permalink. Hehe have fun in Japan. I’m sure you will love it! How can I get a Stock Investment Certificate? hi can you blog about the first letter of explanation you submitted during your first try in applying for a japan visa. i have no itr and no coe and i have no clue what to write. thanks. The first and second letter of explanation have the same content. I just added that it was my second time. Thank you. Thank you for sharing this..😊 how about posting a draft of your itinerary, please? Is it necessary to have a hotel booked already before applying for visa? It is necessary to mention the hotel you’re going to book especially for the first night. I actually booked to different hostels but I just mentioned the first night of the first hostel. Thanks. Hello..i have my japanese guarantor (friend) and he provided all the requirements from his side. I only need to provide Passport and Birth Certificate.. I already travel to malaysia,Hongkon and Singapore..
As long as you have the capability to finance your trip, you’re fine. But then the agency will give you advice. Hello, i really want to travel Japan as it is my 1st bucket list musthaves. I also have the problem of not having an ITR or COE since i am a freelance wedding singer/ band in the Philippines. Im 29 years old and i want to fly to japan on the 30th bday as my bday gift to myself. Is it going to be an issue if I tell it on my letter since they will misinterpret that Im planning to be a singer in Japan for good if I will mention that I am a singer? Or will just tell them that im an online travel blogger too like what you mentioned? I just saw a blog telling not to mention anything being a “Freelance” .Please help me. Thank you! Hi Monique, if you have enough money on your bank account, show your bank certificate as it is required. On your letter of explanation, please mention that it will be a birthday trip for yourself. What’s your other job? I just registered my Lights and sounds ownership just this month, may i present my BIR and mayor’s permit as another additional requirement for me to justify that I will be going back to the Philippines? Thanks for answering. Me and my friends are planning to go this November 2016 in Japan. I have an COE however not sure if I will produce an ITR since I just got a job. I can get an old ITR where in I a have a part time work with the same company I am regular now. Should I still count this as my requirement or create a letter of explanation? If makikita naman nila na madami kang pera sa bank account mo, it’s okay. then who knows, your next application is multiple entry visa na. Wow..magdilang-anghel ka sana ms.roxan 😊😊😊 thank you for your response. God bless.. Please show your DTI registered business that is a great help that you have the reason to return coz you have a business. Nagpaplan akong pumunta ng japan..wala din akong ITR pero may work ako kaya lang dpa ako regular sa pinagtatrabahuhan ko..anu kaya ang dapat kung gawin…pero may bank certificate ako…pwde kaya un..
Kahit baguhan ka sa work, try to ask ITR or Certificate of Employment tapos include bank certificate. Thanks. I don’t have any real answer to your question but you have to show the embassy you can afford to travel. O sa next year ka na Lang mag apply para matagal ka sa stock market. Hi miss roxx.. possible ba mag submit ng coe khit wlang itr.. kasi i was informed na april pa daw ang release ng itr nmin sa office..
Hi! My aunt who is a US citizen is going to finance our trip to Japan this coming December. I quit my job last year so I don’t have an ITR and COE. What other documents can I present? Thanks in advance! Since your aunt will shoulder the expenses for your Japan trip, she needs to submit documents that she can afford the trip. You can ask the accredited travel agency for more info. Thanks. Hi Ms. Roxanne, we’re planning to go to Japan but since im working at the cooperative manpower agency hindi sila pwede magbigay ng ITR kase they’re TAX Exempt. pwede ko po ba isubmit din ang certificate na yon patunay na tax exempt sila pero ang nakalagay sa certificate is para yon sa cooperative not individual employees? You need to submit Certificate of Employment tapos yeah anything nagpapatunay na Tax Exempted ang coop you are working with. Thanks. Please go to your desired accredited travel agency to handle your Japan visa. The agency can give you advice on which documents you need to submit since it’s your father who will pay for it. For sure, your father needs to submit documents for employment, bank statement or certificate and other things. Thanks. I am planning to apply for a tourist visa to Japan. Yun po bang letter of explanation one page lang po ba or pwede na two pages? Sensya po sa tanong ha wala kasi akong ITR. Thanks in advance po. Thanks so much for posting this blog about this topic. My partner of nearly five years ( British) and I have been wanting to go to Japan for a short holiday ( a week ). I have been reading blogs and it always includes ITR on the list of visa requirements for japan. I have none since I have not been working since 2010. I have traveled to several countries in Asia and also to UK February this year. What are some of the documents I need to submit to replace for the ITR?. I do have a property and a Life Insurance in the Philippines. And the trip expenses will be shouldered by my partner. Thanks very much for the response. I would really appreciate it. Just show your documents that you own properties and life insurance. Please also write a letter of explanation that your partner will pay for your trip. He needs to submit any proof of documents that he can afford paying your trip. Also ask the accredited agency for advice so that they can guide you. Yes please mention that you are still a college student. Who will pay for your trip? For sure they will ask any documents from you for a proof that you can afford the trip. Parents ko po 🙂 Bale papakuhain lang ko po sila ng Bank Certificate since yung father ko po ay OFW, and yung mother ko po housewife po. Oh yes pwede yan. As a student bring your study load as well proof yan na student ka. Im planning to go to Japan this summer and in the process of applying a visa but im still a student.I have a travel gift certificate which will I will use for airfare.Do I need to include it as additional requirement?. I already have the copy of my study load,certificate of enrollment,School Id,NSO,2X2,and the schedule of my trip. I added also an Affidavit of Support signed by my Father.Do I need to attached his Bank Certificate?.Im also in the process of getting my Bank Certificate. Is Php 40,000 enough for a 4 days 3 night trip? What documents am I lacking or needed? Okay Thanks😁 Is there anything needed or lacking? Hi Miss Roxanne! How can I get a Stock Investment Certificate? I have COL financial account. thank you. Hi! your post is very useful.. I hope you could help me..
Me and my son are full blood Filipino (from Philippines) and we’ve never been to Japan. I’m a single-parent and would like to work in Japan.. I want to bring my son with me there so I can enroll him at a daycare/nursery in Japan while I’m at work. Do you think it’s possible to happen? I’m really having a hard time finding answers to this problem. 🙁 as well as to what type of visa should me and my son apply for. 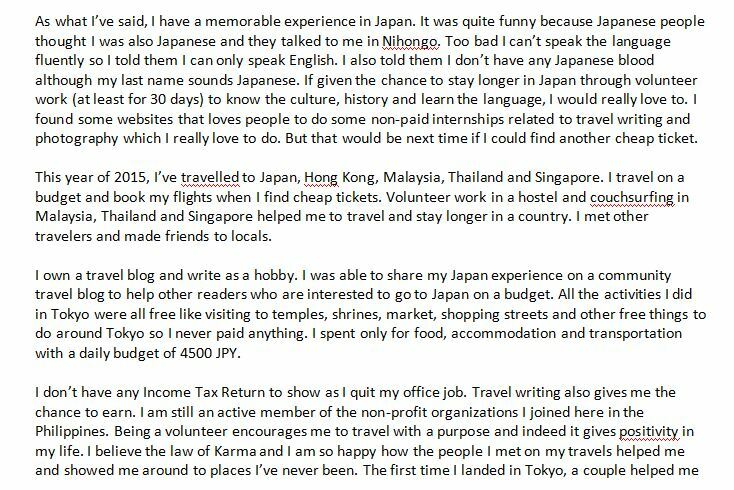 Initially, my plan is to apply for a tourist visa for both of us and find a job in Japan that can sponsor a work visa for me. The thing is, what would my son’s visa would be if mine would change to work visa? does enrolling him to a nursery will help him get a different kind of visa too? my mom who is in USA is the one who would give me all the financial support until we can finally settle-down in Japan. She would get an Affidavit of Consent and Support for me and my son stating that she would shoulder all the expenses that we need. therefore, the requirements such as bank statement (under my name), My own Income Tax Return and my Certificate of Employment will not be needed anymore.. that’s what I think of since I haven’t had a job since I got pregnant up until now that my son is already 1y.o. I’ve been a full-time mom.. but is that correct? Does my mom have to show an American bank statement? How should she provide me the money we need? Via bank or what? My bestfriend who is a half Japanese lives in Japan, do you think she can do some help for me and my son too? Thank you! any advise would be very much appreciated!! You need to get a working visa to Japan if that is your plan. I am not sure if you can bring your son and live there. I have a feeling it is sort of difficult since living in Japan is expensive. For sure, the immigration will ask you a lot of questions. I see. But my mother would help us financially until I get a stable job. She’d provide apartment rent, utilities, even food. Is that still gonna be a problem? This blog is very helpful! I’d like to ask what information is included in the stock certification. I think number of shares, company is obviously included. But will it include the current market value (Peso Value) of your holdings at the date of request? I’m planning to get a certification kase. I have many questions po. 1st. I have a joined account with my mom. Pwede ba yun ang ipasa ko for bank cert and statement since di ko nilalagay ang savings ko sa bank. 3rd. Sa letter of explanation pwede rin po kaya yun sa korean visa? Thank you very much, Miss Rox. 1st KUng nakapangalan din sayo ang joint account, yes show it ask ka ng bank cert for it. 2nd Anong stock broker mo? Dun ka sa kanila kukuha. Which bank po? Call your bank about it. 3rd Yes explain ka po for korean visa if wala kang ITR. Ask ko lng po sana kase dati na po akong ofw ng japan (tokyo)pero gusto ko po ulet bumalik ng japan for 3 days tourist lng..do i still have to submitt itr kase wala po ako nun eh…tsaka pwede ko po ba magamit na bank certificate yung bank account ng 8 years old kong anak since sa knya lng po kse nakapangalan yung bank account(junior saving)…? I dont know about using your son’s bank account for the bank certificate since anak mo yon. OK sana if ikaw ang anak kasi parents mo ang mag soshoulder ng expenses mo. NOt sure about using your son’s bank account though. Please ask the accredited travel agency baka may ma advise sila sayo. Hello, Roxanne! After successfully getting your Japan visa, I’m curious as to how your encounter with immigration went. Did they ask you a lot of questions, since you did not have a job during this time? When I faced the IO going to Japan, I just smiled and handed him the passport. He never asked me anything and just stamped my passport. Before me, two guys were asked a lot by the IO but they were fine and we were on the same flight. Im planning to visit japan on april this year but my worries is on my ITR issue. For the past 3-4 years ive been working with company that are not registered yet here.So they said we dont have tax deduction yet since the company is registered outside phillippines. I tried to file for my personal tax but unfortunately it requires weekdays to process that which i cant afford to file leave for that as i have loaded works on weekdays. I also tried to contact accountant to fix that for me but unfortunately it didnt push through for the reason that the accountant is not responsive anymore. Having said that, what are the alternative way for me to be approve on my visa application? I also read some article that your bank account shouldnt be not more than 200k as embassy will think i might stay longer than planned. Hi Joana wala akong ITR kasi online lang yung job ko mag uupdate palang ako ng ITR ko this year. Naka apply ka na bah? Anu po ba nilagay mo na work status mo sa Explanation Letter mo? like “Freelance” or what? balak ko kasi mag apply next week. Thanks po sir. God Bless po. Pwede po malaman panu mo sinulat reason mo bakit wala kang itr? Kasi online din work ko. Then balak ko sana this weekend mag aapply sa travel agency. Hi Roxanne. Your info’s really helped. Thanks for that…Me and my whole family is planning for a trip in Japan. My sister is a doctor. Is it possible if she will act as a guarantor/sponsor for all my family’s expenses (parents and a student brother) considering our parents are retired? If yes, what do you think she will provide? I heard she may need an affidavit of support for them but we have no idea where to get that or if it’s acceptable. Her friend is also going. Can she also be a sponsor for her friend? My sister’s friend is handling their family business that’s why she doesn’t have any proof of income or ITR to provide (all are registered under her parents). Hello need po lahat yang sinabi mo ask Lang a lawyer for the affidavit. Yong friend mo need magkakita ng family business permit. This article is very informative. By the way, I am planning to apply for a tourist visa on May 2017. I have a Japanese friend who is willing to be my guarantor and complete all necessary documents by March 2017. Do I need to submit an ITR, COE and Bank Certificate despite that I have a guarantor? If yes, I have sufficient bank balance. As for the ITR, I quit my job August2016 and I was issued with Form 2316 by my previous employer. Can I use that for the ITR? I am currently working as an independent contractor and being taxed by my employer but the income is not as high as the previous work. Do you think I can use this? I can file my own at any BIR. As for the COE, our company is providing a Certificate of Engagement instead of COE… I hope this will suffice as supporting document. I am planning to make a letter of explanation too regarding my ITR. I would like to mention in the letter too that I have 3 purposes on visiting Japan. 1st is to meet my friend(guarantor) and our other friends, sightseeing and visit/check the Japanese Language School I applied for. I will enter the October school term and so I want to submit my documents personally and the area as well. I am also planning to request a letter of invitation from the Japanese school which I will attach together with other documents to be submitted for the tourist Visa. I wanna hear your and readers opinion about this. 🙂 I hope to have the tourist visa approved this May or else I can’t enter October term in Japanese school due to time (6months) constraint. Hi Joana in my opinion you can apply with Tourist visa na kasi kung guarantor baka madami pa process 🙂 and yung ITR mo na form 2316 yan ang requirement. I have a friend old form ng 2316 isinubmit nya. Then add mo nalang yung Certificate of engagemnt mo. These will suffice 🙂 goodluck! Hi!! Meron akong bank account nasa 90k kaso wala akong recent ITR at COE na ipakita.nag quit kc ako sa work 3 months ago ,pwde kaya yun ang ipasa ko ung luma? Meron din akong baranggay business permit ,pwde kaya pang support yun sa 2316 ko? Hi..whats the accredited travel agency in cebu that arrange japanese visa? Thank you for your informative blog po. Pero ang tanong ko regarding sa pagsubmit ng letter of explanation..dapat ba sa Pasay lang tlga i-adress or pwede rn dito sa Davao embassy? Sa Pasay mo Kasi nandun ang main. Baka consulate of Japan yan sa Davao not Japan embassy. 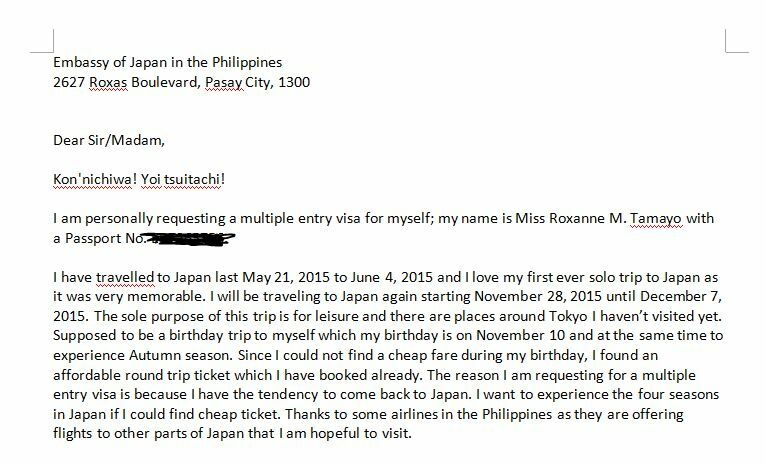 Hello po Mam, Just saw your blog and I really want to gather information about applying a japan visa. My purpose is to visit relatives. My guarantor will be my Aunt’s japanese husband. I already have all the documents that I needed except for one thing.Do I need to make a Letter of explanation since i am unemployed for now. I just came back form UAE last december 2016 as an OFW. I really wanted to go to japan for a visit and now that someone will shoulder all my expenses, i grab the opportunity.. Thank you and god bless. Yes you need a letter of explanation and a guarantee that you will also go back to PH. Thanks for this blog. it is really very helpful! I’ll be submitting my fam and my applications tomorrow already!! but we did not book any airbnb or hotels yet. should we leave it blank at the application form or should we book already? really scareddddd!!! Please put hotel address need po yan sa fill up form po. Thanks. They said within one year daw but just bring your birth certificate. I just got mine as well. Just show your bank statement that you can afford to travel po. Thanks. Ms. Roxanne tanong ko lang po kung may sample letter of invitation kayo pag may guarantor ako. halimbawa po ate ko yung guarantor. Salamat po. Isama mo sa sulat mo na ang kapatid mo ang guarantor. Hi ate rox. ask ko lang po pwede po ba sister ko ang mag sponsor sakin student ofw po sister ko. Hi. It depends po your advocacy. I submitted my application earlier, i provide and completed my docs (itr 1701,permit ,dti and financial statement of my business) under my name (self employed 2yrs). But 2months palang bank account ko for some reason i have old accnt pero join accnt namin ng fiance ko i asked the agency if ok lang pero still so anxious i didn’t know pwede pala yun . And wala pa travel history. Do you think ma grant po ako tourist visa even bago palang opeb accnt ko and no travel history?i planned to travel this june since its my birthday to celebrate outside. Hi Mam. Same issue kasi yung company po namin is hindi nagkakaltas ng tax so walang ITR na nailalabas yung school po namin para sa mga employee na 11k below ang salary ang may ITR is yung mga 12k above. Do I have to write a letter of explanation for that one as well po? Salamat. I think makakahingi ka dun. Try mo daw sa BIR. Minsan tawag nun exemption of income tax kasi below 11k. hi, student po ako at online blogger (freelance) din .. wala akong income tax return pero may bank certificate ako .. wala akong sponsor .. required din ba na bumili na kagad ng roundtrip ticket? tapos mag.apply ng tourist visa?? gusto ko kase pmnta ng japan for tour para gift sa sarili ko kse gagraduate na na din ako .. If you’re a student, then you’ll be fine with enough money to travel. Thank you very much for this article. It’s very helpful. By the way, I’ve learned that they only allow Filipinos with a single-entry visa to stay in the country for 15 days. Even though the visa is valid for 3 months, you can only enter Japan for one occasion. In my case, I haven’t been to Japan. But I’m planning to go there on the April of next year. I know as a first timer, I can only apply for a single-entry visa. Although I’m a free-lancer, I have a Japanese friend who will serve as my guarantor. Do you think it’s possible for me to be granted of a 30-days stay? Ask your guarantor to let you stay for 30 days and write it on the letter. For your next application, it’s really up to the embassy to grant you multiple entry visa. Please disregard my first question above. They usually give you 15 days but if you have convincing reason to stay for 30 days, they will grant you. My second time and 3rd application, they only gave me single entry for 15 days. It’s up to the embassy to grant that. Your bank account matters they only gave me 15 days because I only had 50k sa bank. That I don’t know. It’s up to them to grant you a visa for 15 or 30 days, worse denied. Ikaw, ask yourself if your money can survive for 15 or 30 days. I’ll be traveling to Japan next year (January) and I’m planning to apply for visa this November, but my problem is I only open my account last June, so Bali 5 months pa lang nun account ko. Can I use it kaya? May old account ako, join account actually with my dad Pero pina closed na kasi namin yun. Do you think maggrant visa ko, using only my 5 months account? Thank you in advance. As long as you have a reasonable amount of money for your trip to Japan you’ll be fine. Pls help me naman oh. Okay lang ba mag apply ng japan visa khit yung business na ipapakita ko is partnership? At isa pa pala, can i apply 3mons after getting denied? I need to meet kasi yung partner ko sa business ko since di xa mauwi dito sa pinas. Do i need to right a explanation letter to this? Kung ano yung purpose ko. Its just only 3-5days after that balik na ako. Wait ko po reply nyo po. Hi Mil, having a business (sole proprietorship, partnership, corporate) is good as long as it’s legal and you have the reasons to come back to PH because of a business, then you’ll be fine. I got denied when i applied. But this time i need to meet my business partner. Kailangan ba mag write ako ng letter of explanation? Or anong klaseng letter po ang gagamitin ko po para ma convince ko ang embassy po? Why were you denied last time? Maybe you got denied because the embassy thinks you’re going for a business trip. You should indicate that you will just go there as a tourist. Hi Roxanne, Good day to you. I am planning to go to Fukuoka Japan this coming Sept.3, 2017 I applied for tourist visa. I submitted all the documents except the ITR. I own my business, but I haven’t able to file my ITR hence I submitted my DTI permit together with my previous travel stamps/visa from South Korea and Canada. I also enclose a written explanation why I haven’t secured my ITR. Honestly, I have my previous ITR 2316 but it was issued last year and my previous job was for only 5 months. I am a freelance Teacher and proprietor of my commercial space rentals.My bank account is roughly 60k and planning to stay for 4days.Nagsubmit rin ako ng copy ng itinerary at hotel booking confirmation ko. I just submitted my documents with Discovery tours. Kinakabahan lang kasi ako, when I asked the agent na nag aasisst sa akin di nya binigay yung address ng embassy. I felt di sya accomodating sa mga tanong ko, basta pinasulat nya ako ng letter of explanation. Unang tanong ko,okie lang ba hand written she said yes. Second,she told me i address ko “TO WHOM IT MAY CONCERN” and nung time na tapos na,naalala ko nung nasa bahay na ako di ko napirmahan pero I write sincerely yours then my name. Okie lang ba yun?Less than 15 days from the target date of travel,do you think ma aapprove ako? 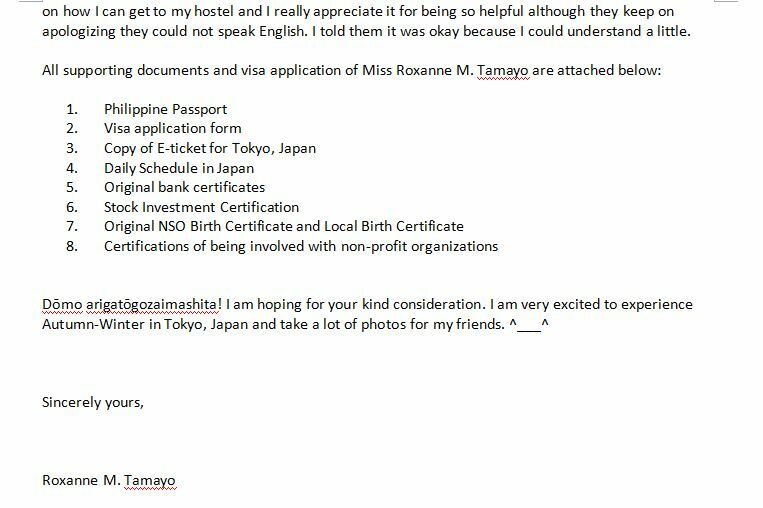 Right now,di ako makatulog praying that they will not decline my application.Birthday wish ko kasi sa sarili ko ang makapunta sa Japan. Sa letter of explanation ko andun na rin yung reason why I want to visit Fukuoka than any other cities ng Japan. Grabe,sana talaga ma approve nila.Wait daw ako mga tuesday pa.Sayang holiday kasi this Monday kaya na uusod.Kindly answer my question thank you. Thank you Ms. Roxanne for your immediate response, until now I am still not happy because I know I can do more. Kinakabahan pa rin ako if anu magiging result. Still praying for positive results. As long as you have a business here in the Philippines you’ll be fine.